Timpir’s schools and students may not have fancy uniforms or buildings, but thanks to the hard work, commitment and dedication of our teachers, donors and supporters we are able to support students to achieve their very best. This has resulted in outstanding performance over the past 2 years, as measured by the South Sudan Primary Certificate Exams. In 2015, our local school, built from local materials, taught by local teachers in Wäramoth produced the number 1 student in the whole of Northern Bahr el Ghazal state. We would like to take this opportunity to thank you for all your support, without it we would not have been able to get these fantastic results. Many thanks to Peter Cassidy for changing the Timpir website so that we are now able to more easily post updates on our projects in South Sudan. Here is the fist of what will be regular updates on the progress and developments of Timpir’s projects. These are the first group of Year 8 students to successfully graduate Wäramoth Primary School. Graduates included 1 female student. The students did very well, most have now gone on to high school with some finding employment with NGOs. at the end of 2013. All 13 students (including 1 female) passed their exams successfully, with several achieving in the top group in the Wäramoth region. Timpir has again been supporting our two schools in South Sudan in 2014. 8 teachers have been employed at Wäramoth Primary to teach 411 students in Years 1 to 8 (245 boys and 166 girls). The Wäramoth community continues to maintain the buildings that have been built over the past 8 years, and all the buildings are currently in good condition. The toilet block with a hand washing tank out the front. that has built a toilet block (with pit latrine toilets) for the school. This is fantastic news for hygiene and sanitation, and the school community is very proud of their new amenities! The new desks in the classroom. Students sitting on bricks and the ground in classrooms. Wäramoth Primary School has also been lucky to receive support to make 45 desks for students. Previously students would sit on the ground or on bricks or stones that they had found. Now 3-4 students are able to share a desk which enables them to write in their books and sit for the school day much more comfortably. At this stage only the Year 5-8 classes have desks. at Mabok PS (97 girls and 286 boys). Excitingly, Timpir has employed a female teacher at Mabok for a second year, and it is hoped that this will help to encourage more girls to attend school. Despite the current challenges facing much of South Sudan, Northern Bahr el Ghazal (the state in which Timpir currently operates) is stable and secure. This enables us to continue our important work and continue to educate the future generation of South Sudan. We look forward to our second cohort of Year 8 students (17 of them, including 1 female) sitting their exams at the end of the year, and wish all our students all the very best for their continued studies this year. The Timpir newsletter for June has been released, see it here. In addition, Timpir has just started running a lunch program at our two schools. South Sudan is on the brink of a massive famine. This report released in March this year highlights the impending famine, and the situation has only got worse since that time. With bad crops in 2011, food supply in the region at very low levels due to border closures, and the escalating costs of food, many people in regional areas, such as Wäramoth and Mabok are starving. Timpir is assisting as best it can, and will employ cooks at the two schools to prepare cooked lunches for more than 700 students currently enrolled across the two schools. This lunch program will mean that each day Timpir’s students have at least one meal, and this will also enable their families to spread their meagre food supplies across their remaining children. It is planned that we will carry out this lunch program during the months of June to August, as by September the rains will hopefully have brought a supply of fresh fruits and vegetables to the area which will sustain families until their crops are ready in October/November. Well we are now back in Australia safe and sound. Unfortunately we didn’t have internet access in South Sudan as we had thought we would. So thanks to Mum for updating the Timpir blog after each phone call I had with her while we were over there. As a substitute I’m now going to post a detailed blog to summarise the trip. So on February 1st, Kuol, Akon and I departed Adelaide and travelled to Kampala, Uganda via Perth and Johannesburg. Peter, the current Timpir chairperson, also left Adelaide on February 1st and travelled via Dubai and Addis Ababa to Kampala. We all arrived in Uganda on Thursday February 2nd. After a much-needed sleep at the Lodge in Kampala we drove into Kampala city first thing on Feb 3rd to try and obtain visas for South Sudan. After a few hours and meeting with about 4 different people (with Akon managing to charm everybody she met) we had our visas by about midday. We then raced off to the Air Uganda office to book our flights to Juba which we accomplished by about 1pm. We dashed back to the Lodge to pack our things and scoff down a quick lunch before driving out to Entebbe airport where we boarded a flight for Juba at 4pm. A quick 1 hour flight later there we were in South Sudan at Juba International Airport. We were picked up from the airport and dropped at the South Sudan Hotel 2 where we then spent 2 days (3 nights) trying to arrange flights to Aweil. We were eventually helped by the friend of a friend to obtain seats on a Kush Air flight to Aweil on Monday February 6th. The Timpir crew after lunch on the Nile in Juba. It was an early flight to Aweil, so we found ourselves at the relatively new Aweil airport at about 11am, which gave us time to do a bit of shopping in Aweil market before driving the 2.5 hour bumpy ride out to Wäramoth in the hire car that Kuol’s brother Piooth had arranged for us. We arrived at Kuol’s family homestead at about dusk on February 6th and set up our tent (minus the flysheet) which we had taken over in 2008. Unfortunately the chickens had destroyed the flysheet so Kuol utilised some local material to make sure that all and sundry couldn’t see into the tent. The next few days were spent in Wäramoth acclimatising to the about 40 degree heat. Kuol’s family held a welcome party for which a cow was slaughtered and many friends and relatives from the surrounding villages came to welcome us. Unfortunately Peter was out of action for the welcome party as he had picked up giardia from a meal he ate on a day trip to the main local town, Ariath, the previous day. On Friday February 10th a meeting was held with many of the parents of students at Wäramoth Primary School. In addition members of the school committee and teachers, as well as Peter, Kuol and myself attended the meeting which went for several hours. During the meeting we listened to many of the parents, committee members and teachers talk about things they were satisfied with at the school, things they were dissatisfied with, things that were being done well and things that could be improved. During the meeting we were able to gain a very good insight into how Wäramoth Primary School has been operating over the past 4 years and plan with the community which directions the school should take in 2012 and into the future. After the school meeting in which the topic of the bricks made for the school was raised several times, Peter, Kuol and I decided it was time to take action. The bricks were made by community members in 2010 and were made on the banks of a river about 30 minutes walk from the school. Timpir made a horse and cart available to the community to facilitate the moving of the bricks from the site where they were made to the school location, but for a number of reasons primarily relating to local community politics, this was never done. On Saturday February 11th, Kuol rallied a group of volunteers and Peter, Kuol, Akon and I drove out to the brick site with the group where they began preparing the bricks to be moved. On Sunday February 12, the Timpir group drove back to Aweil town where we made ourselves comfortable at the South Sudan Hotel in Aweil for 3 nights. We had hoped to shop for resources for Mabok Primary School on Monday 13th, but due to sanctions on Sudan (which South Sudan is as yet undifferentiated from) we were not able to use the Timpir visa card with the money required to purchase the resources. Instead we contacted Mum and Dad and then had to wait until the money was wired over from a money sending office in Adelaide to one in Aweil which did not happen until the morning of the 14th. The 14th (Valentines Day) was a hectic day. First thing in the morning we went to see Yel who has been making the 10 wheelchairs commissioned by Timpir for 10 people in Mabok region with mobility disorders. We were hoping that the wheelchairs were going to be ready in time for us to take to the people in Mabok when we went there, but unfortunately due to skirmishes on the north-south border, the trucks carrying the remaining materials needed to complete the chairs had not made it to Aweil from north Sudan. Yel is himself the user of a wheelchair and he constructs wheelchairs for others from his home where he has basic welding and metal work materials. All the remaining materials have since arrived from the north, so Yel is currently working to complete the 10 chairs so that they can be taken to the recipients in Mabok. After seeing the wheelchairs, we then went to collect the Timpir money from the money sending office. On our way to the money sending office we drove passed Dut who had received a wheelchair from Timpir in 2008 and stopped to talk to him. While he chair is in need of some repairs it is still serving him well. We then made some very quick shopping for resources including 2 very large saucepans for cooking school meals at Mabok, 4 jerry cans for collecting water, a number of text books and exercise books and various stationery. Then the car headed off for Mabok, a very bumpy 2.5 hours east of Aweil. On our way to Mabok we stopped off in the main town of the area, Tiaralieet, where some of the people who are going to receive wheelchairs had gathered. Unfortunately we were much later in getting there than we had initially planned, so some of the intended recipients had already returned to their homes. When their mode of transport is crawling through dirt that bakes in the hot sun, it was understandable that they didn’t want to wait around until the hottest part of the day for our arrival. However we did get to meet and talk with 3 of the people who will receive chairs. Finally at about 2pm we made it to Mabok Primary School and our arrival brought tears to my eyes. As our car drove in to the school grounds one of the classrooms erupted in song, colour and movement as a large group of women who had been patiently waiting in the shade for our arrival leapt up and started singing, dancing and ululating. The people of the Mabok community had waited for most of the day for our arrival, many without having eaten or drunk anything for the entire day. But they so desperately wanted to meet us and talk with us, they were willing to withstand the wait. The Mabok community meeting was started almost as soon as we arrived and was very well attended by parents, community elders, teachers and students. During the meeting it became very clear that while the community greatly valued our support with Mabok Primary School, the most pressing issue was a severe lack of water in the region. Currently women walk for two hours each way to the nearest bore hole. After fetching 20 litres of water (the most a woman can carry on her head at once) she then walks for another 2 hours back to Mabok where the water is only just enough for her family to drink and cook meals for the day. One elderly lady showed us where the hair had worn off her head from carrying water. Another elderly man said he had not bathed for several weeks because of lack of water. They emphasised that the difficulties in accessing water meant that many students and teachers go through a whole day at school without drinking. I was quite overwhelmed by the absolute desperation of a community with such a scarcity of water. The Timpir group assured the community that we would do our best to try and find a more sustainable means of water access for the community. The headmaster of Mabok (who is employed by the Government of South Sudan) updated us about the school describing how despite the difficulties with a lack of water and resources, over 400 students had completed the academic year in 2011. He was very thankful for Timpir’s support through paying the salaries of 2 teachers during 2011, and emphasised that while there are 2 teacher at Mabok paid by the government and 2 teachers paid by Timpir, there are a further 7 teachers who volunteer at the school to ensure that all 400 students are able to learn. He also thanked Timpir for their financial assistance which enabled the community to build a further 5 classrooms for the 2012 year, but said that due to the lack of water in the region they are waiting for the wet season before they will be able to construct the walls of the classrooms which need to be done with mud. Community members also strongly requested that some time in the future they would greatly like a school building made with bricks and a zinc roof so that it does not require as frequent labour intensive maintenance as the traditionally built classrooms. At about 4.30pm we left Mabok and started the long, arduous journey back to Aweil. We were joined by a goat which was given to us by the Mabok community as a sign of their appreciation for our support. Had we arrived earlier in the day, the community would have slaughtered the goat and cooked it as a welcome and thank you meal. Unfortunately on our way back to Aweil our car broke down and we were all quite apprehensive with the idea of spending the night in the bushland of South Sudan with no food, no water and 7 people and a goat to fit in the back of a landcruiser all night (we couldn’t sleep outside because of hyenas and other wild animals). Luckily a car came past and gave Kuol, Peter, Akon and I a lift back to Aweil. But Kuol’s brother, Piooth, the driver of the car, Mou, and a very helpful Mabok local, Ngor, who lives and works in Aweil but volunteers to assist Timpir in helping the Mabok people and had joined us for the day, spent the night in the back of the landcruiser with the goat. At 6am on the 15th when it was still pitch black, Kuol loaded a jerry can of fuel into a rickshaw and traveled the hideously bumpy 25km journey to the broken down car (one of the fuel tanks was dodgy) and recovered the car, Piooth, Mou, Ngor and the goat. When they had returned to Aweil and all eaten a good meal (having not eaten the previous day) we did a bit more shopping in Aweil market including purchasing 200 mosquito nets with money donated by Insight. We then drove back to Wäramoth. The next few days were spent in Wäramoth having meetings with the teachers from Wäramoth Primary School and a meeting with the school committee. At the school committee meeting the mosquito nets donated by Insight were given to the committee. We have learnt from the Timpir Christmas Gift programs of 2007 and 2008 that it is best not to give people things for nothing as this creates a welfare mentality that is detrimental to development. So instead the school committee members (9 people from a variety of clans and regions surrounding Wäramoth) were given instructions to distribute mosquito nets as ‘payment’ to those who volunteer in the community in any capacity such as maintaining the school buildings, carting bricks from the river site to the school, cooking for the children during school term etc. In addition, the school committee will also be responsible for facilitating a new Timpir project, a donkey and plough micro-loan. One of the major things that struck us on this visit was the starved look of many people in the villages. In 2011, following the successful independence of South Sudan, many people returned to the villages from north Sudan where they had lived for decades. On their return they had to clear trees, build houses and farm land that they had not farmed for twenty or more years. On top of this in 2011 there were bad rains across the region which resulted in poor harvests. So while harvest only took place in November and usually by February people still have ample food supplies and are looking relatively healthy, this year people are already hungry and there is a clear sense that things will only get worse as the year draws on until the next harvest in November 2012. The number of people who are facing starvation is staggering and this is a famine that most of the world is unaware of. Timpir is only a small development organisation that is not equipped to take on the sort of relief that will be necessary to stave of the famine. However, with our development caps on and through conversation and partnership with local community members a scheme was devised to try and reduce the labour intensiveness of cultivation and increase the outputs for a number of local families. It was decided that Timpir would provide the finance for the community to purchase 10 donkeys and ploughs (approximately $400 per set). We purchase 5 ploughs and 1 donkey while in Wäramoth and the balance of the money was left with the school committee to purchase the remaining 5 ploughs and 9 donkeys. These donkeys and ploughs will be given to families in need as determined by the school committee in each of the 10 ‘ suburbs’ which surround Wäramoth. They will be given on a micro-loan basis where the $400 will be repaid to Timpir through selling a small portion of each years harvest over the next 3-4 years. Timpir will then be able to use this money to continue supporting additional families. It is also envisaged that some other more wealthy families in the area will see this farming technique and purchase their own donkeys and ploughs to assist with their farming. 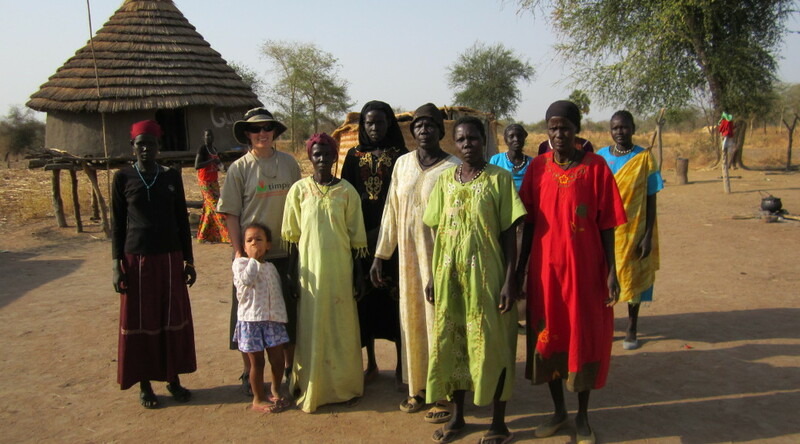 On Saturday February 18th the Timpir group bade goodbye to Kuol’s family who had accommodated us and drove back to Aweil. Unfortunately we were not able to stay in the South Sudan Hotel as it was hosting peace talks between Dinka Malual and Misseriya elders to try and put an end to fighting along the border regions. We stayed in a neighbouring hotel, then spent Sunday trying to find flights. It became clear that we were not going to be able to fly out of Aweil in time, so we drove for 3 hours to Wau where we stayed the night. Early Monday morning we went to Wau airport where we were told there was an 8am flight to Juba. At the airport we were told that flight was cancelled. We drove to the airline office in Wau town only to be told that airline had sent all its aircraft to Ethiopia for maintenance and repairs. There were no airlines scheduled to fly from Wau to Juba until Wednesday, the day after we were due back in Kampala. On only option was to get a UN flight, which after much tooing and frowing we eventually managed to get. At about 2pm we flew out of Wau and landed in Juba, where we made our way once again to the South Sudan Hotel. After a night there were flew back on a morning flight to Uganda. On Wednesday 22nd, Peter departed for a Gorilla safari in Uganda. Kuol, Akon and I flew out to South Africa on the 23rd. And now sadly we are all back to normal old life in various parts of South Australia finding it hard to imagine that only 2 weeks ago we were hurtling around the villages of South Sudan! The group arrived safe and sound in Kampala yesterday. They had a busy time delivering aid but frustrated at not being able to do as much as they would have liked. The planes from Aweil were full so they made a quick drive to Wau flew from there to Juba then on to Kampala. Akon sounds very happy in the background but, she was very disappointed to leave her cousins, friends and the family’s goats in Wäramoth . Peter heads off on the Gorilla Safari today while the Baak family have a day of rest. Back in Adelaide on Sunday, Pt Pirie Monday. The group arrived in Aweil on Monday ready to shop but found their Cashpassport card would not work because the banks have sanctions on Sudan. The rest of the world does not seem to have recognized that South Sudan is now a separate country. They called home for some cash to be transferred but it was 4.05pm and the banks here were closed. They had to delay the shopping and find some accommodation for the night. Tuesday morning Kuol was up early but the money transfer place doesn’t open until 10.00am. They need to buy school supplies and probably every mosquito net available in Aweil. They looked for blackboards but to no avail. So now they are off to deliver text books, stationery and exercise books to Mabok school. The wheelchairs do not appear to be completed yet so they will attend to that on their return. A successful meeting was held with the community resulting in the election of a parents’ committee. The horse was used to bring the bricks from the river to the school. The group are hoping to travel to the 2nd school in the Mabok region on the 13th. Members of the group are experiencing the usual travellers stomach ailments, hopefully all the medications that were carried will fix the problems. The group have made it to the village of Wäramoth. They managed to get a car in Aweil, although I believe it may have a few fuel issues. On the first day Peter learnt about sitting around and greeting many family and friends that came to visit Kuol’s family and friend from Australia. After 2 nights in Juba, the group successfully secured hotly contested seats for a flight to Aweil. 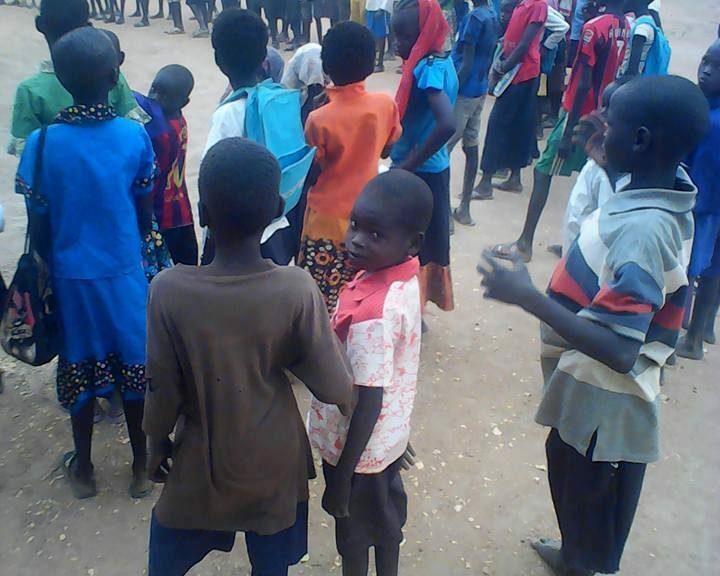 They arrived safely in Aweil at approx. 10.15am this morning the 6th Feb. They are hoping to travel to the village of Wäramoth this afternoon. All their luggage got there, so they have succeeded in getting all of the medical gear they were able to carry through the various customs. Akon sounds very excited. They hope to have phone access in the village, the updates will be dependent on this.